Video Comments module shows the latest comments made on the videos. 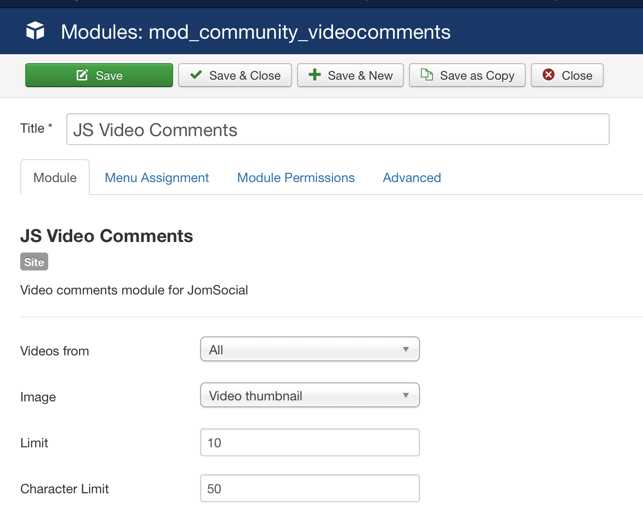 Videos from - Using these criteria, select what kind of video comments you want to show in the module. All - Module will make a mix of all the comments posted in user, group or event videos. Profile - Module will list only comments from the profile videos. Group - Module will list only comments from the group videos. Events- Module will list only comments from the event videos. Image - This option allows to select what kind of image to show before comment. None - will display no image at all. Poster avatar - will show the avatar of the person who made the comment. Video thumbnail - will show the actual thumbnail of the commented video.